If you’re a business or manage a piece of land, our experienced team can take complete care of your trees, and advise you on tree management. Besides offering all the tree surgery skills you would expect, we’re qualified to complete tree condition surveys. We’re also experienced in applying to work with trees under tree preservation orders, and in carrying out recommendations made in tree health & safety surveys. And we’re fully insured. Reshape trees to let in more light, rejuvenate an old tree, or prune fruit trees to improve crops. Fell trees in tight spaces, remove stumps, and cut out deadwood or damaged branches. Advise on what to plant and plant it. Care for existing trees to keep them healthy and happy. 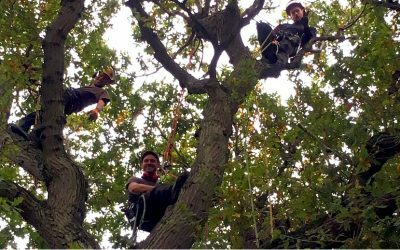 In tree surgery and arboriculture – tree health, tree management & tree law. Recycling everything we can and using power tools only when we must. Comprehensive public liability and employers’ liability cover. We’re based in Brighton and work across much of the Sussex coast and South Downs, from Seaford in the east to Arundel in the west, and up to Guildford in the north. We’re based in Brighton and work across much of the Sussex coast and South Downs, from Eastbourne in the east to Chichester in the west, and up to Surrey in the north. Get in touch to organise for us to come and see your tree(s) and give you a free quote. It takes a matter of hours to fell, process and dispose of a mature tree that has taken decades sometimes centuries to grow and we have become very good at it, but with great power comes great responsibility.